After graduating from NSAC in 2011, it took Samuel Bourgeois one year to realize that the grass isn’t always greener on the other side. It was this choice that eventually led him to the title of Young Alumni of the Year at Dalhousie University Faculty of Agriculture’s 2017 Blue and Gold Awards. The Blue and Gold Awards honour alumni who have distinguished themselves through outstanding service to Dal AC, their communities, Atlantic Canada and beyond. The Young Alumni of the Year award recognizes the outstanding achievements of Faculty of Agriculture alumni aged 40 and younger. Alumni are recognized for outstanding achievement that may have earned them regional, national or international prominence through service to humanity in their profession or volunteer organizations, through community service or the advancement of knowledge and service to the Faculty of Agriculture. A third generation farmer, Sam operates Belliveau Orchard alongside his father, Robert (Class of ’81) and sister, Sonya located along the picturesque Petitcodiac River Valley in Memramcook, New Brunswick. The farm, bought by Sam’s grandfather in 1967, has been in operation since 1932. 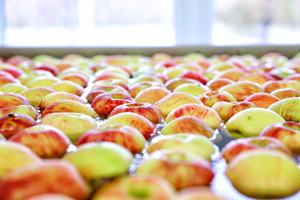 It is home to over 70,000 apple trees planted on nearly 100 acres, 90 acres which are currently in production and 10 acres not yet in production. Each year, more trees are planted to ensure the farm can keep up with market demand and to replace old orchards. 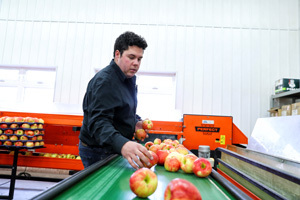 They also operate a packing facility that sees apples from growers in New Brunswick, Nova Scotia, and Prince Edward Island. In the family for 50 years, Belliveau Orchard has 45 full time employees and an additional 40 employees during the busy summer season. 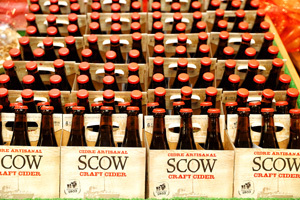 In addition to growing apples, the farm also produces sweet cider, hard cider, juice, and award-winning wines. In addition to employing members of the community, the farm is a popular agro-tourist destination. The farm offers a fall U-Pick, tours and an on-farm café and market. 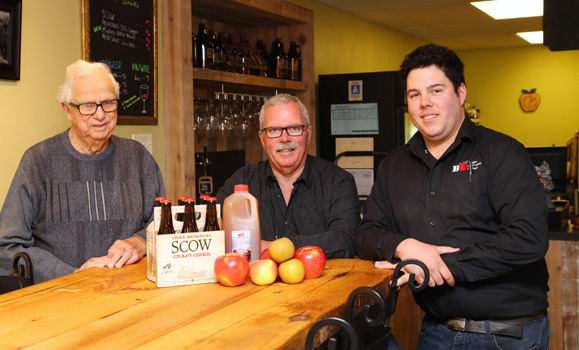 During harvest season, Belliveau Orchard serves over 7000 guests, each week, at their café. Growing up farming with his family, Sam chose to study at Dal AC to expand his knowledge of farm management. He completed a diploma in enterprise management (farming) and after a year of working elsewhere, returned home to New Brunswick to farm with his family. Sam explains that his choice has been nothing but rewarding and their accomplishments fill him with a sense of pride. While at Dal AC, Sam was also an active member of the woodsmen team. He was also enrolled in the Atlantic Agricultural Leadership Program, a program that provides an 18-month, advanced-level training to leaders in the agricultural industry. Despite his busy schedule, Sam is also an active member in his community. He is a director with the Agricultural Alliance of New Brunswick, and has been a volunteer firefighter for the past 12 years. Of course with any business, the farm hasn’t seen such success without a few bumps along the way. Challenges arise when least expected, from government policies to labour shortages to a weak market, yet Sam and his family have kept their sights set on the goals they have set to achieve. “At the end of the day, you need to keep going ahead and follow your vision,” Sam says. As for their plans for the future, Sam hopes that the farm will continue to thrive and expand. An asset to their surrounding community, it is the hope that the farm continues to have a positive impact on the local businesses in their area as well. Sam is humbled by Dal AC’s selection of Young Alumni of the Year. More than deserving of the award, Sam explains that he wouldn’t be where he is today without all that he learned during his time spent studying at Dal AC.